Held annually on April 22, the purpose of Earth Day is to raise global awareness and support for environmental protection. First celebrated in the United States in 1970, Earth Day is now recognized in 192 countries. The non-profit organization, Earth Day Network (EDN), has assumed responsibility for networking and coordinating Earth Day events around the world and has chosen this year’s theme: Trees for the Earth. To learn more about the Trees for the Earth project, to register your own Earth Day activity or to search for a possible Earth Day event in your area, go to: earthday.org (#Trees4Earth). Earth Day was first celebrated in Canada on September 11, 1980. It marked the end of an entire week of activities that included tree plantings, lectures, workshops and community garbage and litter cleanups. Flora MacDonald, the MP for Kingston and the Islands, marked the opening of that week by planting a tree and urging organizers and MPs to make Earth Day an annual event. By 2015, many schools and community groups across the country were organizing events to mark Earth Day on April 22. Earth Day in Canada is a national charitable organization. It was established in 1990 with the intention of providing Canadians with information, tools and support for classroom studies and environmental projects. The EcoKids Program is just one of their many initiatives. This program provides free educational resources, games and activities to teachers and students from Kindergarten to Grade 8. Earth Day Canada also organizes various contests and campaigns and helps to coordinate community Earth Day activities for April 22. For more information, you can check out the Earth Day Canada website: www.earthday.ca. Staples Superpower Your School Contest is held annually. Elementary and Secondary schools across Canada are invited to submit a contest entry form that describes the environmental actions taken by the school during the past year. A screening committee, in collaboration with Earth Day Canada, selects ten entries and the winning schools are awarded $25,000 worth of technological equipment. To learn more about the contest go to: staples.ca/powereco. 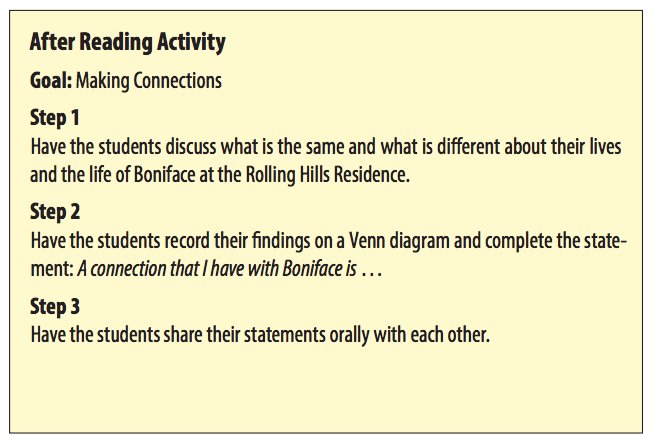 Books frequently become catalysts for classroom discussions and environmental action plans. We have listed several such titles on our book review pages this month. Additional titles received too late for our review process are featured below. 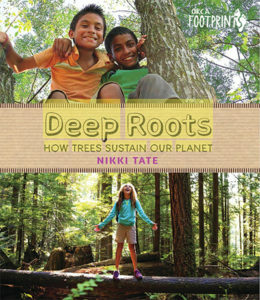 Deep Roots explores the many ways in which we need trees to keep our planet healthy and livable. From making rain to producing fruit to feeding fish, trees play an integral role in maintaining vibrant ecosystems all over the world. A perfect resource to support this year’s Earth Day theme. 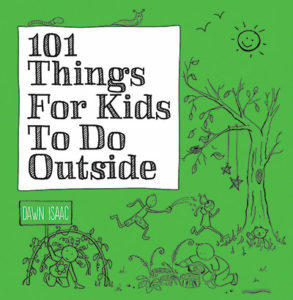 This special handbook encourages children to go outside and play. The activities are described in language easy for 6 to 9 year-olds and illustrated with engaging graphics and large pictures. The activities range from 10 minutes to hours of fun. by Michelle Mulder (new paperback edition). Full of examples of unusual power sources, Brilliant! 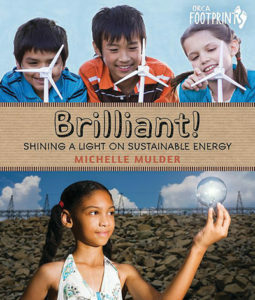 encourages kids to look around for new and sustainable ways to light up the world. Pedal It! 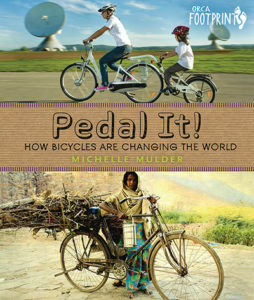 celebrates the bicycle and shows why and how bikes can make the world a better place. Not only can bikes be used to power computers and generators, they can also reduce pollution, promote wellness and get a package across a crowded city. Pedal It! encourages young readers to be part of the joy of cycling. The following title, Hope Springs, is based on real-life events at the Rolling Hills Residence (a home for 52 orphans) in the Mbooni District in Kenya. It is part of the larger Hope Development program that author Eric Walters and his wife Anita helped to found. Every summer Eric spends time at the Rolling Hills Residence. The Hope Springs well water project was completed in July, 2013. 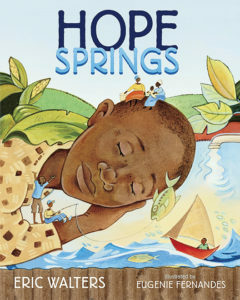 Hope Springs tells the story of a young boy named Boniface who lives in an orphanage in Kenya. A severe drought has affected the area for some time. Each day some of the children are sent down the mountain path with containers to collect water at the spring where the local villagers get their water. It was so small and there were so many people that it hardly seemed possible there would be enough water for everyone. But the water kept coming, drop by drop. Slowly it seeped from the rocks onto a small muddy puddle, little trickles filling big containers. Henry, Boniface’s houseparent, explains that the village people acted badly because they were afraid that the spring would dry up and that they would be totally without water. A well digging project is begun at the orphanage. Each day Boniface hurries home from school to help. Sometimes he moved the pile of dirt and chipped rock away from the edge of the hole. Eventually water rushed into the bottom of the well. Over the weeks that followed, pipes were laid and the pump was connected. At each step, Boniface watched and helped. It was like a miracle. The well made a wondrous change for life at the orphanage, but the villagers were still desperate for water. Boniface asked Henry if they could donate their time, knowledge and the left over pipes and cement to build a proper well at the spring. Henry and Boniface met with the villagers and organized the project. With all the people working together, the little spring became a well. And there was enough water—and enough kindness—for all. Hope Springs is a story of the kindness and generosity that emerges when Boniface comes to understand the fear that motivated the villagers’ behaviour. Used as an example in classroom discussion, this story could lead students to develop effective strategies for understanding and coping with bullying behaviour. The last five pages of the book are illustrated with a map and photographs of the Rolling Hills Residence and the well building project. In this section, Eric Walters tells “the story behind the story” and describes the critical need for establishing stable sources of clean water in the rural communities of Kenya. 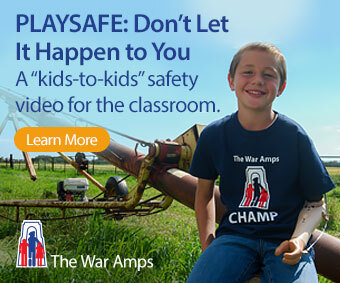 The Hope Springs story would make an excellent springboard for classroom discussions around the protection of clean and sustainable water sources both locally and globally. Schools interested in an Earth Day fundraising project could go to the author’s website and find details about student sponsorships, well building projects and more: creationofhope.com.